So how do you make an edible jungle? Take 16 talented cake-artists, 6 months and an exciting and colourful theme. 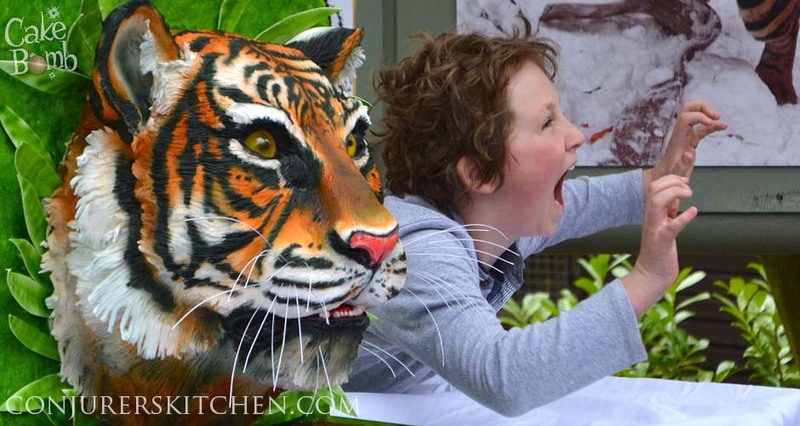 Mix them all together to produce one breath-taking edible installation for The Cake and Bake Show, Manchester 2014. 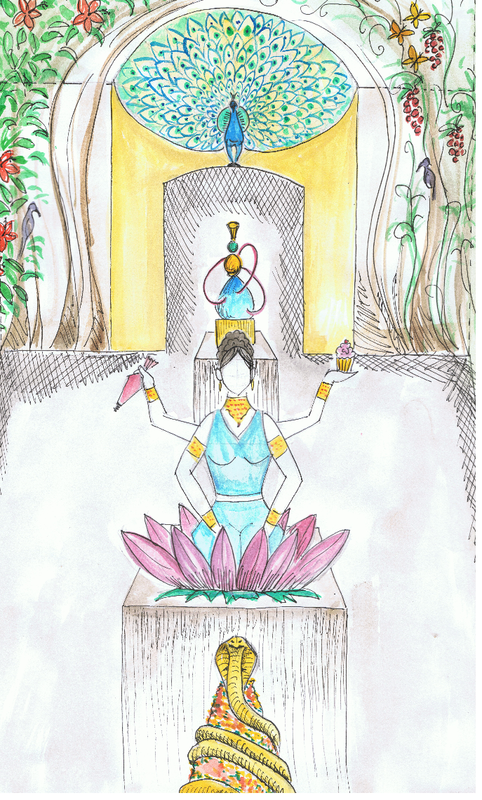 Early concept designs for ‘Welcome to the Jungle’ with Kashmira the fantasy goddess. 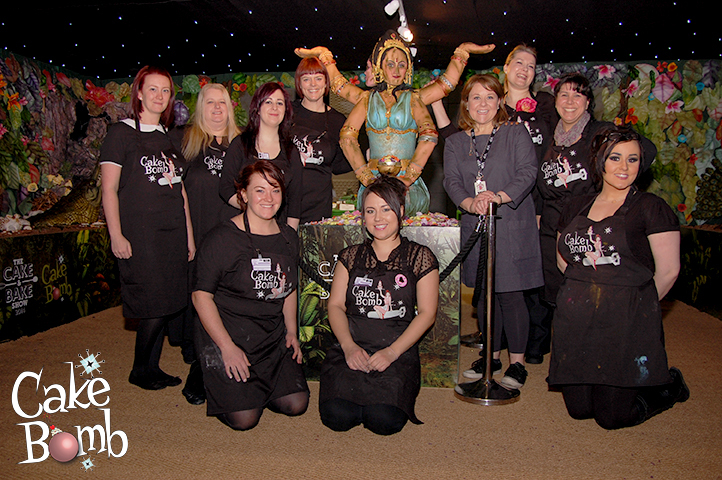 The CakeBomb management team brought together some of the cake industry’s leading sugarcraft talents and conceived, controlled and co-ordinated this ambitious project entirely via the internet. The team were located throughout the United Kingdom, as well as in the United States, but were able to plan and prepare the jungle by communicating online. 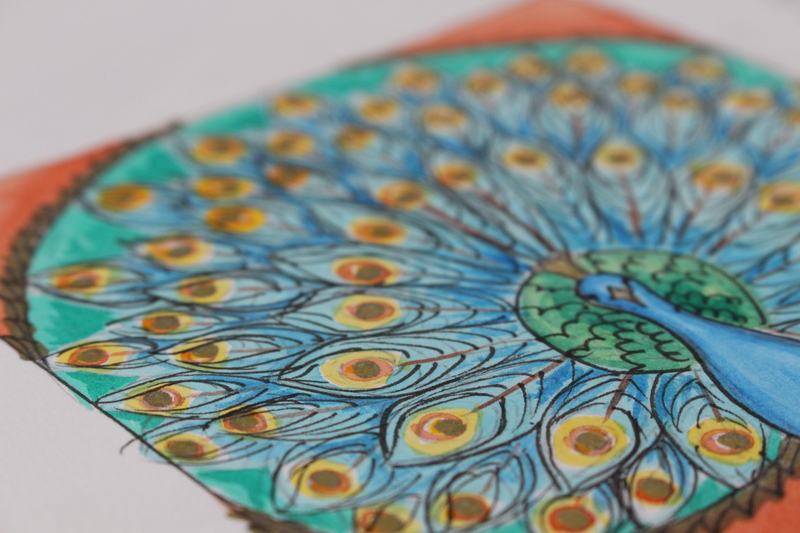 By brainstorming ideas, the theme of an Indian Jungle won through. The potential for creating varied foliage, flowers and animals in this theme produced a lot of enthusiasm from our artists, but the additional prospect of including bright patterns and interesting architectural features was also particularly exciting. Sketches and mood boards gave the team a general direction in which to plan so that tasks and budgets could be allocated and, from there on, the CakeBomb jungle was full-steam ahead! Each member of this particularly unified team brought to the project their own skills and talents and also a willingness to share their particular expertise with the others. In addition to creating at least one feature piece of their own, each artist contributed flowers and foliage in large quantities to ensure the surroundings were as impressive as the animals and features. The walls, the tiles, the dirt and the insects and grubs: all edible and all part of the jungle experience. 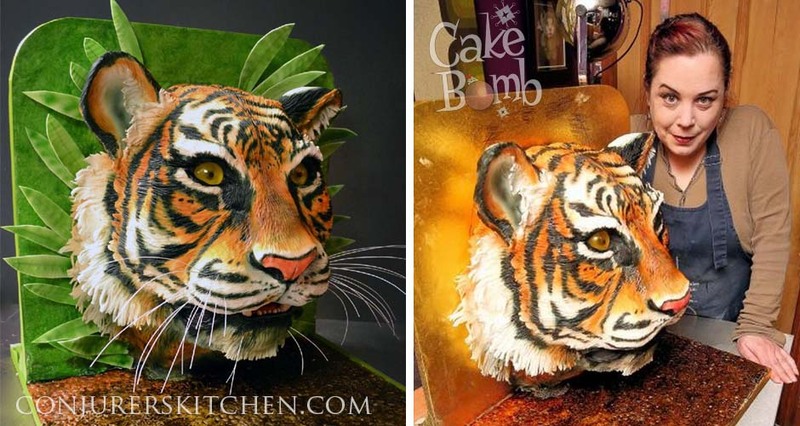 The CakeBomb Jungle has been a fantastic collaboration which could not have been conceived of before the internet. Most of the 16-strong team had not even met in person until the set-up for the show itself. The internet has enabled the team to plan to the most minute detail and the final execution was down to the military-style planning that such an event requires. 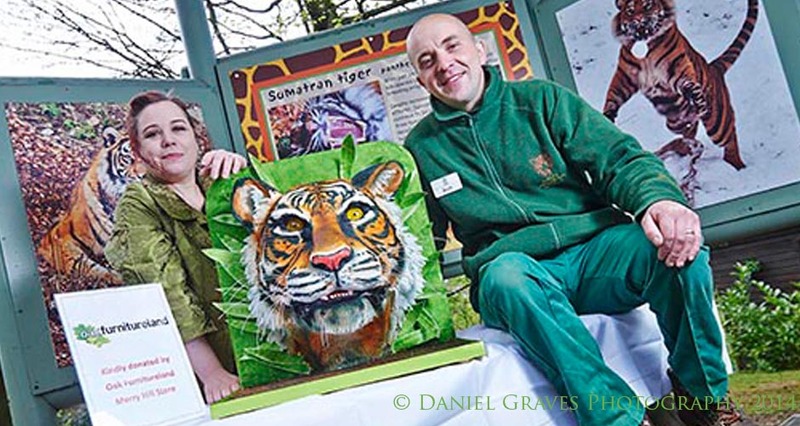 Is this the birth of a new form of cake art, we think so! 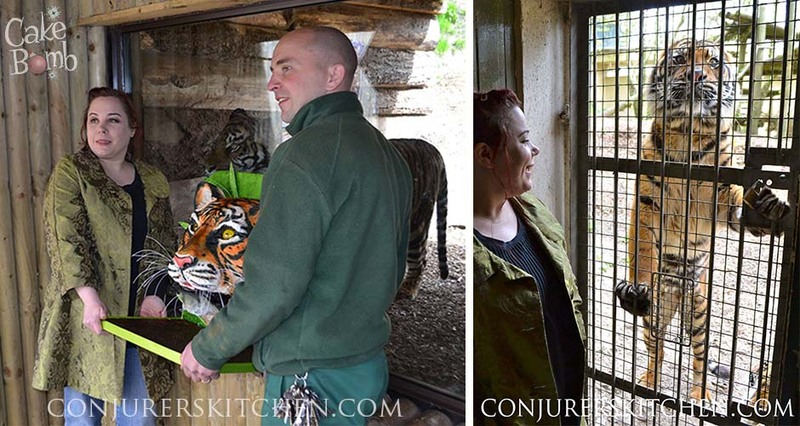 Did you visit our jungle? Don’t tell us you missed out?! 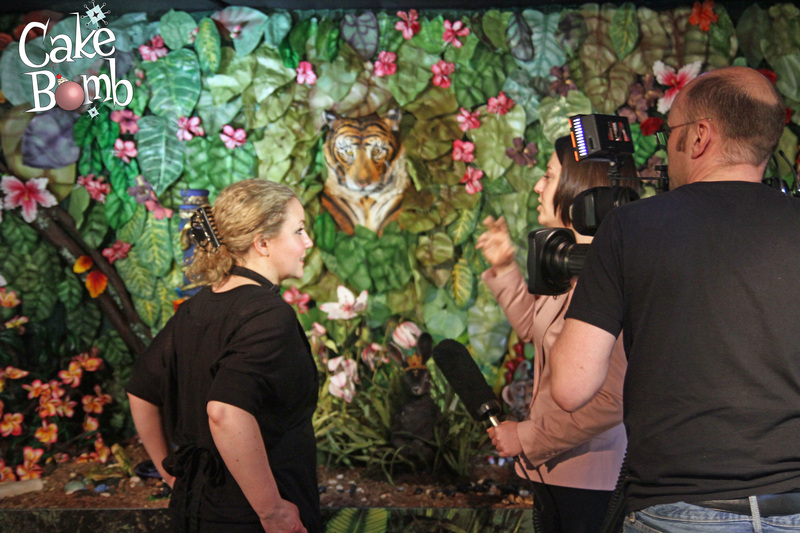 CakeBomb hit the The Cake and Bake Show Manchester with a bang as its life-sized edible jungle went down a storm with the public and the media alike. 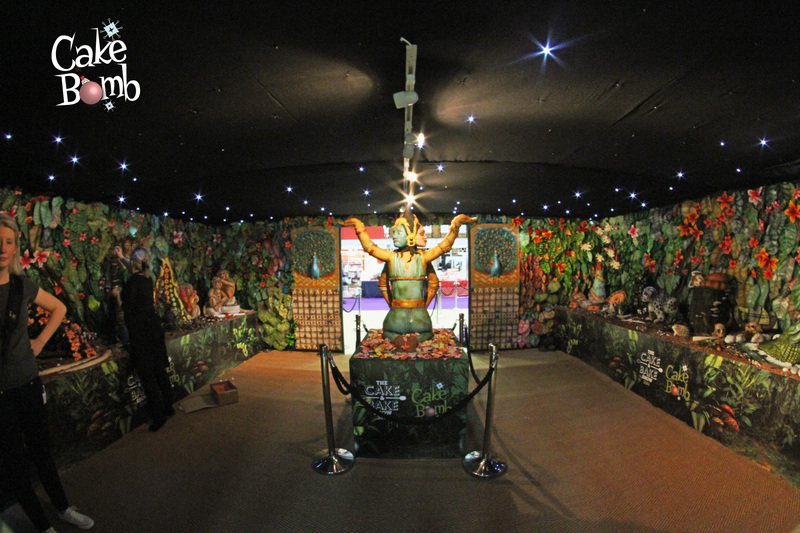 With an Indian theme to add Bollywood bling and sparkle, the CakeBomb jungle was full of creatures ranging from earth worms to tigers. 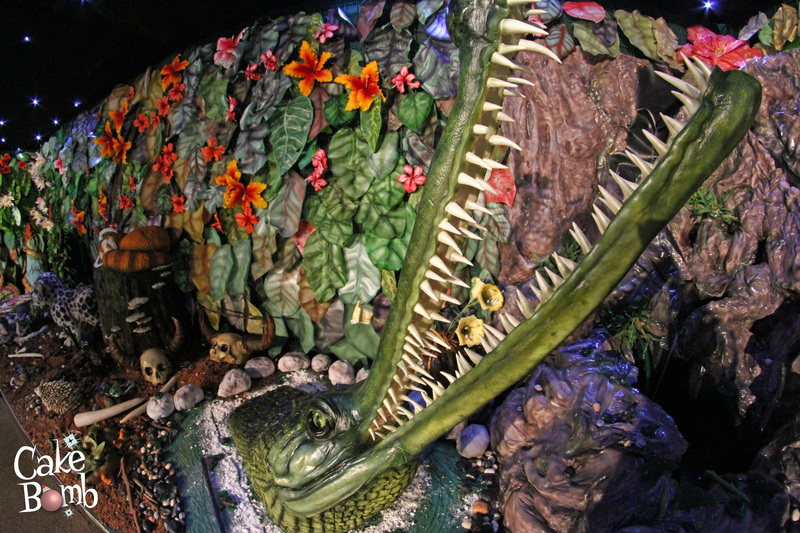 The jungle featured a working waterfall, smoking hookah pipe and the smells and sounds of India. 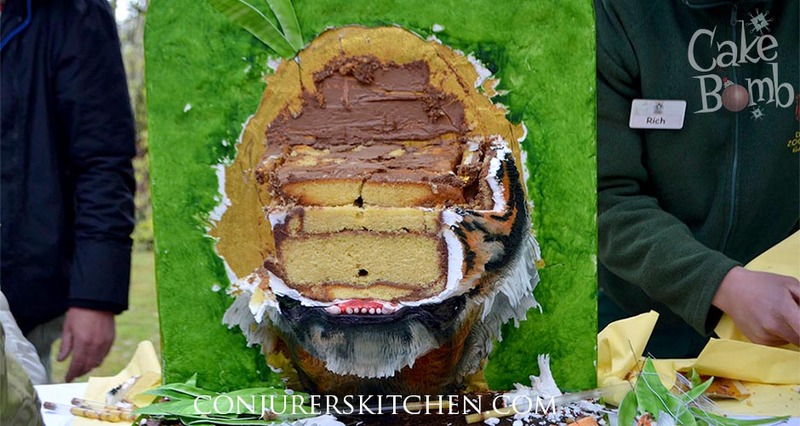 Kashmira, the four-handed, three-headed fantasy goddess took centre stage and the delicious fruitcake body was cut by celebrity chef Rosemary Shrager. 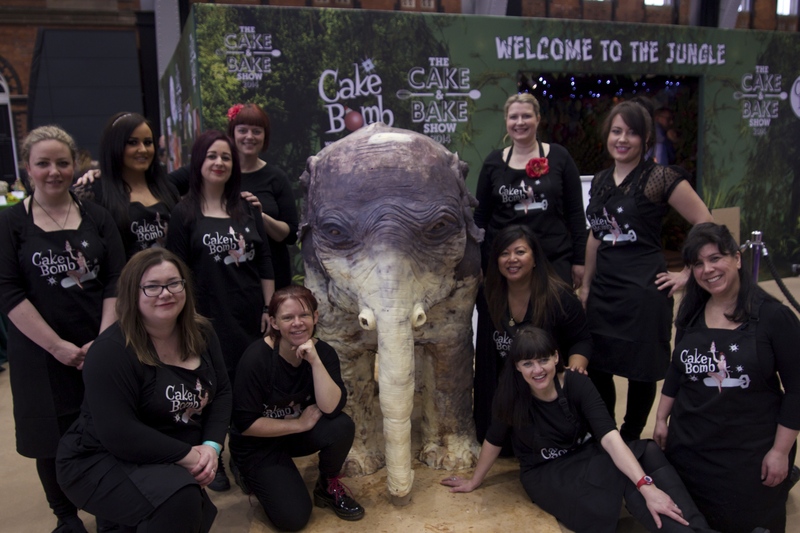 And how could we forget the life-sized baby elephant cake created and worked on by the team in front of the watching crowds. It was cut by Rosemary with the help of Great British Bake off winner John Whaite and celebrity pâtissier Eric Lanlard, cheered on by our guest compere Ted Robbins and the friendly Manchester crowd. Manchester you were wonderful. Consider yourself ‘CakeBombed’. The CakeBomb gang before the show began. 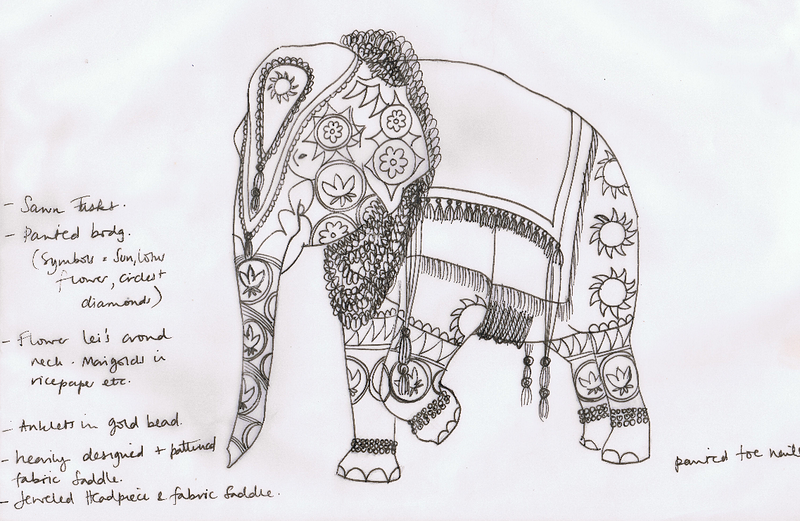 Beyonce the elephant is about to get blinged! Kashmira our goddess with the CakeBomb gang and actress and Masterchef finalist Wendi Peters, who popped by a few times to visit the jungle. 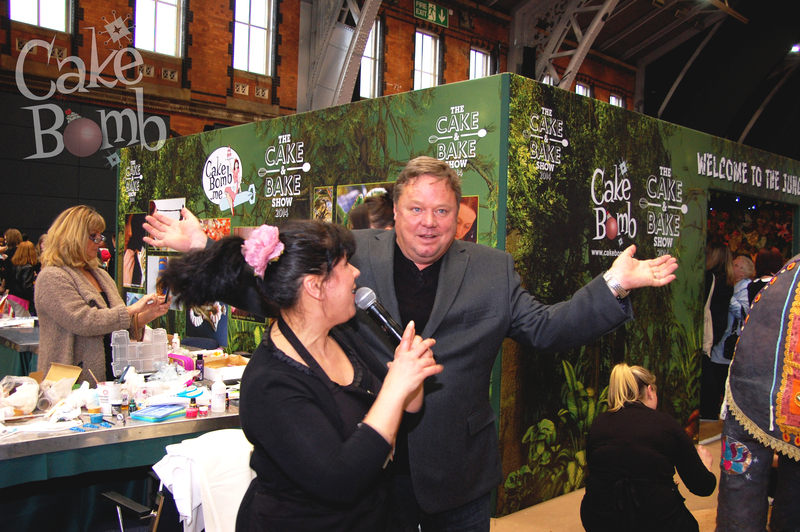 Rosie Cake-Diva interviews Ted Robbins (Molly’s dad!) who (along with doing an impression of our goddess) very kindly helped compere during the cutting of our elephant. Cheers Ted! Beth Mottershead being interviewed by the BBC. 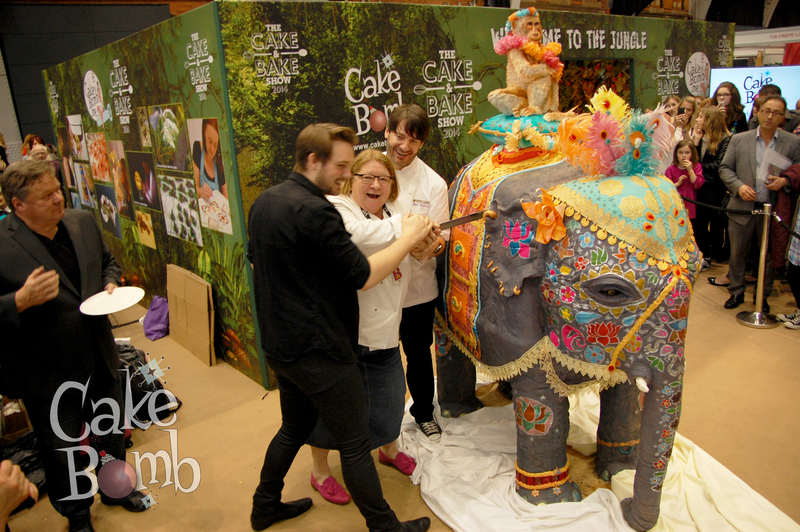 John Whaite, Rosemary Shrager, Eric Lanlard join forces to cut our decorated elephant! 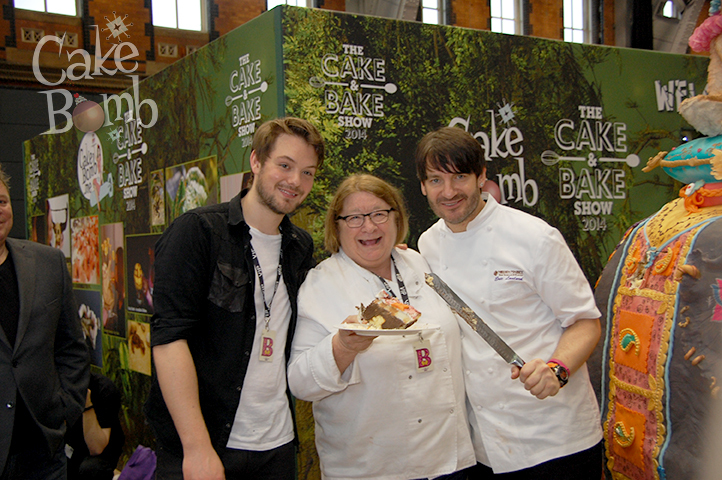 Great British Bake-off champ John Whaite, and chefs Rosemary Shrager and Eric Lanlard teamed up to cut a huge chunk from our elephant on our final day at the Cake and Bake Show Manchester.